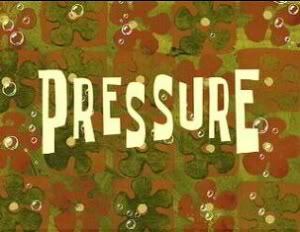 Pressure (Episode) – From SpongePedia, the biggest SpongeBob-wiki in the world! SpongeBob and Sandy are relaxing, looking at the flower shaped clouds until they talk about who would win a race to the top of the big mountain. So Sandy challenges SpongeBob to a mountain-climbing contest, SpongeBob blabs on, not knowing that Sandy is already half way there. SpongeBob hurries on after, and it looks like he got up there before Sandy, but Sandy still wins. SpongeBob then challenges Sandy to a running race to the Krusty Krab, and Sandy blabs on, not knowing that SpongeBob was halfway there. Sandy catches up, and it looks like she wins, but SpongeBob wins instead. Sandy gets angry because it was not fair and keeps saying that land creatures are better than sea creatures with hurtful examples, and the sea creatures do things that Sandy can't do. She is angered by Mr. Krabs, SpongeBob, Patrick and Squidward's jokes, she takes off her helmet and her suit. She eventually cannot breathe, and uses a pickle jar as a substitute. Sandy then feels very insulted and challenges Mr. Krabs, SpongeBob, Patrick and Squidward to go above the surface for 1 minute. They do that, but in the process get beaten up by The Seagulls from land. When Sandy goes up to congratulate them, she finds out that the four men are getting beaten up, she beats the seagulls and saves her friends. They float down and apologized and all ends well, except for the Seagulls, whose feathers have been taken off! In the episode Tea at the Treedome, SpongeBob and Patrick nearly die when they are in Sandy's house, but when they are above water, the air does not seem to affect them. When Sandy says, "Yeah, well this is an accident", the rocks change color as Sandy pushes them down. In the episode Big Pink Loser, Patrick jumps out of water, but in this episode he can live overwater. How would Sandy have survived when she put on the pickle jar as it would have filled with water when it was opened? This page was last modified on 22 August 2010, at 12:40.